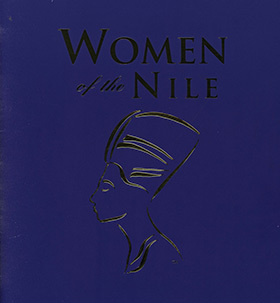 Women of the Nile was a traveling exhibition by the Rosicrucian Egyptian Museum that toured Canada and the United States between 1999 and 2001. Its intent was to showcase the unique prominence of the role that women played in ancient Egyptian society and culture, especially as compared to that of their successors. Women of the Nile sought to fulfill that goal by displaying a wide variety of artifacts divided into the categories of home life (including various domestic tasks and activities), the temple (highlighting Egyptian goddesses and the roles of women in worship), politics, and matters of the afterlife (the goddesses, burial, and depictions of the afterlife). Artifacts that were displayed regarding home life covered a range of activities, most notably childbirth, and included depictions of women doing various daily tasks. In the home life section, there were also amulets, bottles, and similar objects carved in the visages of the deities Tawaret (protector of pregnant and nursing women) and Bes (protector of children and the vulnerable). Many of the figures and carvings of women were apparently used to invoke fertility and successful childbirth under the belief these depictions would make them manifest in reality. Other artifacts included marbles, mirrors, different types of jewelry, and various containers for makeup and perfume. The artifacts centered on the temple were primarily depictions of Egypt’s female deities, such as Sekhmet, Isis, and Hathor, in addition to objects used in the act of worshipping. The portrayals of the deities ranged from statues to reliefs, while the items for worship were mostly sistrums (musical instruments meant for use in the temples of ancient Egypt) and cat statues presumably used as votive offerings to earn the aid of the cat-headed goddess Bastet. The most prominent role played by women in politics in ancient Egyptian was shared by the mother and principal wife (sister/half-sister) of the ruling king, seemingly in reflection of similar relationships among the deities of ancient Egypt. The corresponding artifacts in the exhibit included depictions of the queens, whether in physical form (statues and reliefs), or as names in royal cartouches, or in regalia used by the queens, particularly the remains of a triple uraeus that would have been attached to a crown and a sistrum for use in religious ceremonies. The last section of Women of the Nile was devoted to the subject of women in relation to the afterlife. As such, it displayed depictions of deceased individuals, models of female servants meant to do work in the afterlife, and various other objects. These objects were found in ancient Egyptian tombs that presumably held women, whether individually or as family tombs.